Over 90% of our manufacturer-trained service staff has worked with us for a decade or longer. That experience translates into a vast knowledge base and the ability to perform repairs correctly and efficiently. New Holland’s web-based ASIST™ program gives us access to factory specialists and engineers to discuss your particular repair issues whenever needed. In addition, with our extensive library of repair manuals, we have information at our fingertips for a wide range of equipment. Because productivity is essential to your success, it makes sense to choose our experienced repair professionals who will minimize your downtime and help you to make the best use of your resources. 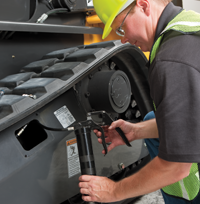 Franklin Equipment’s facilities are equipped with state-of-the-art diagnostic tools that provide accurate machine evaluations to pinpoint problems with engines, drive trains, or hydraulic systems. Our shop staff is factory trained to correct equipment problems quickly and cost effectively to minimize your downtime. Franklin Equipment offers repairs on any components. When a replacement is necessary, remanufactured components are an economical alternative. We offer a wide range of remanufacturing services that include engines, transmissions, torque converters, hydraulic pumps, hydraulic cylinders, and drive units. All remanufactured components meet OEM standards and carry a warranty comparable to new component warranties.